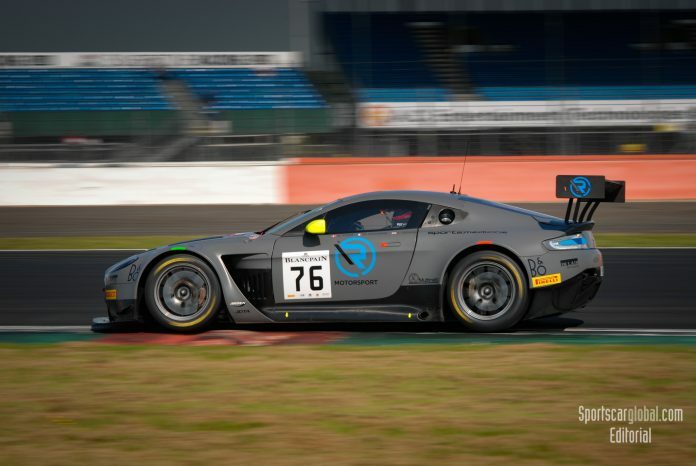 The #76 R-Motorsport Aston Martin V12 Vantage scored a dominant victory from pole position in today’s Blancpain GT Series race at Silverstone. 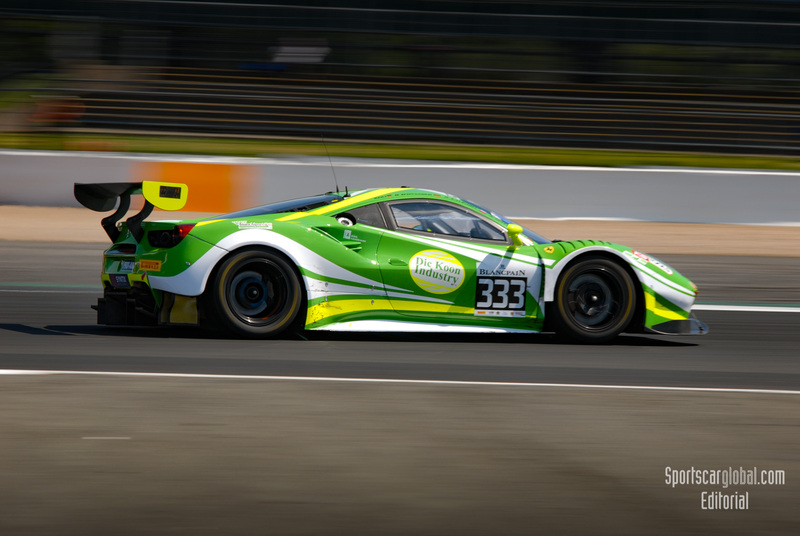 Matthieu Vaxiviere, Jake Dennis and Nicki Thiim won by almost 11 seconds to comfortably secure a first overall victory for the British marque since 2013, when they triumphed at the same venue. However, the story does not end there ……. Following the disqualification of the #76 car from qualifying, the result remains provisional pending an appeal from the team against the penalty. 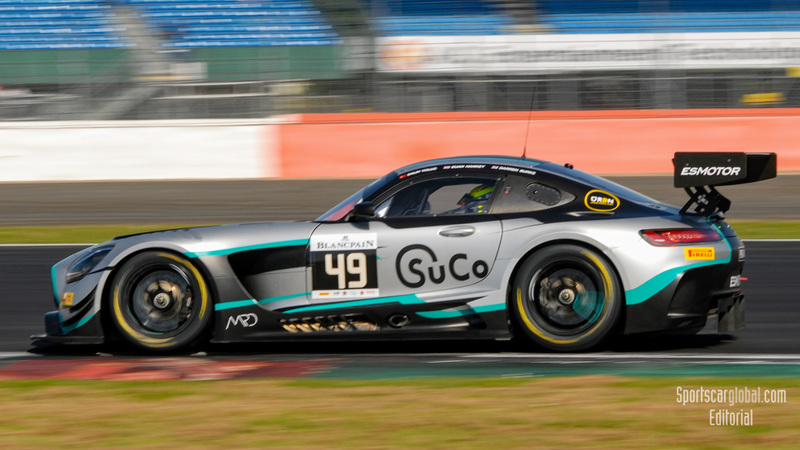 Starting from pole, Vaxiviere led away from the #88 AKKA ASP Team Mercedes-AMG entry of Adam Christodoulou and began to edge ahead at the front of the field. The Frenchman built a lead of around two seconds, but as the first round of pit stops approached Christodoulou trimmed the gap. That would prove to be significant when Christodoulou handed the #88 Mercedes over to Tristan Vautier. Vaxiviere remained on track longer before stopping and handing over the Vantage to Jake Dennis, but the British driver emerged close behind Vautier. He did not remain there for long, however. Dennis quickly caught the Mercedes driver and made a decisive move to re-take the lead, displaying a clear pace advantage in terms of pace. From this point onwards, the Aston never looked to be under serious threat. Dennis quickly built a comfortable gap over Vautier, holding a lead of 12 seconds by the time of the second pit stops. 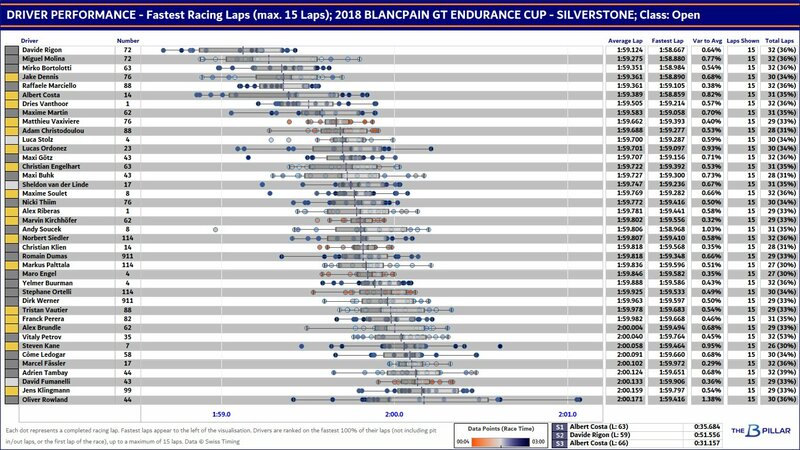 They were not the fastest driver though, as the analysis below from our partners at the B-Pillar, shows, the SMP Ferrari was super quick at times, but it’s all about the whole package, not a few quick laps. Behind them, the #144 Emil Frey Racing Lexus of Norbert Siedler had moved into third position. 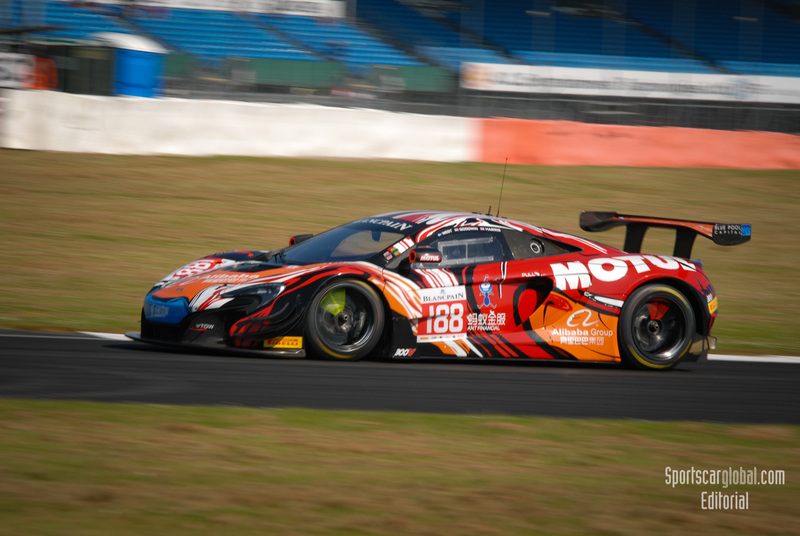 Stephane Ortelli had run well in the first stint before handing over to Markus Palttala, who elevated the car into third spot by passing the #62 R-Motorsport Aston Martin with a bold move at turn three. Out in front, the #76 Aston Martin pitted from the lead with a comfortable advantage and emerged from the stops with an even bigger lead. From there Thiim was able to take a calm approach during the final stint, with Raffaele Marciello taking over the #88 Mercedes in a distant second. Behind these two, however, there was plenty of action. The #114 Lexus held third into the final stint, but there was a charging Dries Vanthoor to contend with. 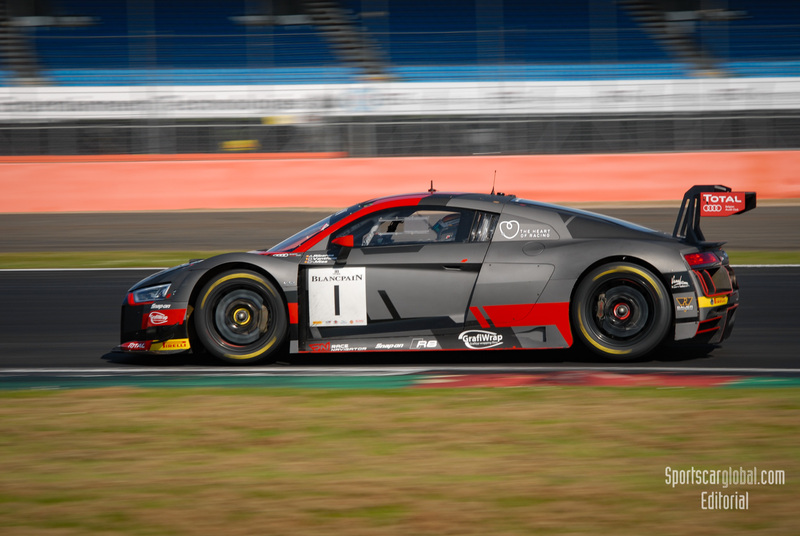 Just as was the case last time out at Monza, the youngster had a fresh set of tyres on the #1 Belgian Audi Club Team WRT machine he shares with Christopher Mies and Alex Riberas. Vanthoor homed in on Norbert Siedler, who had taken the controls of the #114 Lexus, but was met with a robust defence from the Austrian driver. Despite Vanthoor holding an advantage in pace the #144 held firm to secure a first Blancpain GT Series podium for the Lexus brand, which sparked emotional scenes in the Emil Frey Racing garage. Out front Thiim remained cool to win by a shade under 11 seconds, with Marciello following him home in a comfortable second spot. While the destination of Pro class glory always looked assured, this was not the case in the Silver Cup class. Throughout the first two stints, victory looked to be heading to the #54 Emil Frey Jaguar G3. Having scored a comfortable class pole, the car of Alex Fontana, Adrian Zaugg and Mikael Grenier went on to lead the first two stints, but technical problems cost them dear in the closing hour. That created an opportunity for the #6 Black Falcon Mercedes-AMG crew to take top spot. Despite facing pressure from the #78 Barwell Motorsport Lamborghini Huracan, the crew of Abdulaziz Al Faisal, Hubert Haupt and Gabriele Piana held firm to take class honours. The Pro-Am category was more straightforward. 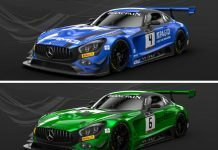 After a first-lap incident ended the hopes of the pole-sitting #333 Rinaldi Racing Ferrari 488, the #49 Ram Racing Mercedes-AMG soon assumed control of the class with Darren Burke at the wheel. He remained cool to hand over to Salih Yoluc leading Pro-Am, with the Turkish driver successfully navigating a largely trouble-free stint. Finally, Euan Hankey took charge of the car with a comfortable advantage and was able to complete a home victory for the Ram squad. There was a popular home win in the Am Cup class too, with the Garage 59 McLaren 650 S GT3 of Chris Harris, Alexander West and Chris Goodwin triumphing with a healthy advantage. It had not always looked like being that way, however. Harris spent his stint battling with the #488 Rinaldi Racing Ferrari 488 machine, which ended with the McLaren running second in class. But, following the first round of pit stops, West was able to take control of the Am Cup category with a comfortable lead. He successfully extended that advantage before handing over to Goodwin, who was untroubled as he took the car to the chequered flag. 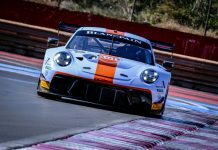 The Blancpain GT Series will reach its halfway mark at the next event, with round five of the 2018 campaign taking place at Paul Ricard. 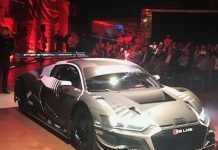 The 1-2 June contest will see the Endurance Cup continue with a six-hour race into the night at the high-speed French venue.